The Asus ROG Strix GL503VM-FY108T is a 15-inch laptop with versatile / game orientation. Behind a design redesigned with elegance and character, the PC is based on a solid Quad Core i7 Kaby Lake, on a large amount of RAM (16 GB) and a 1.2 TB hybrid storage. Opposite, the GTX 1060 Pascal takes care of the graphics part with the support of a beautiful Full HD IPS screen mat, enough to offer comfortable and rich game perspectives. A proper connection and a backlit RGB keyboard on 4 zones are added to the lot for a price displayed at less than 1450 euros with a bag and a mouse. As seen throughout the gaming sector in recent times, the design of the Asus ROG Strix GL503VM-FY108T prefers to seek sobriety and remove all the glitzy details that adorned the older generations of ROG. The black aluminum cover features a structured diagonal that highlights the brushed effect worked with the ROG logo in a bronze / silver color. Namely that the latter is backlit in red when the PC is turned on. Overall, the design is rather successful and balanced. Inside, we discover large screen borders and a keyboard surround covered with a soft-touch finish for a very simple visual. That color lovers can rest assured, the backlight of the multicolored keyboard allows customization by key (Aura Core). 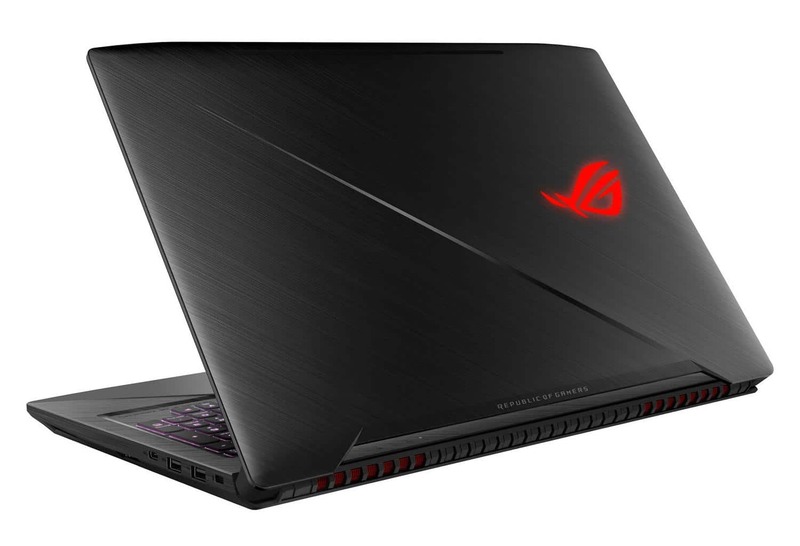 Side measurements, the Asus ROG Scar is significantly thinner than most of its direct competitors (Acer VX15, Lenovo Legion Y520). The autonomy is not strong because it does not take more than 3 hours and 30 minutes away from a socket. Asus has been full of performance in its new Asus ROG Strix GL503VM-FY108T and it starts with its powerful heart. 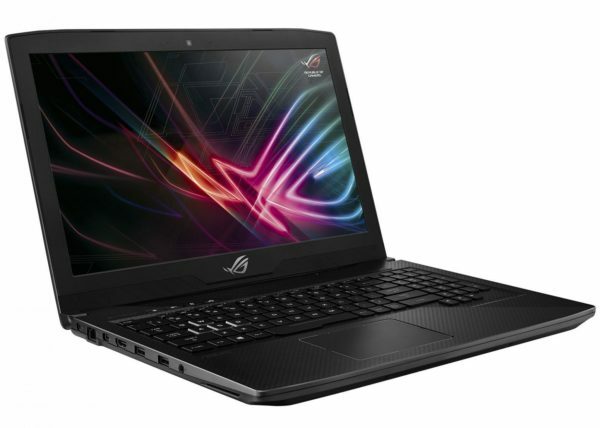 Supported by a Kaby Lake i7 Quad Core and 16 GB of RAM, it flies over common tasks and allows versatile enthusiasts to perform all the demanding missions of video editing or 3D modeling. With the generous amount of RAM, multitasking is more comfortable and the game gains fluidity, something to satisfy collectors of tabs on the browser. Note, however, that the thinness of the chassis may involve higher temperatures during prolonged demanding use, which may have the effect of curbing the processor. In contrast, storage plays a key role in PC performance. This is a hybrid storage solution that includes a dedicated 256GB SSD and a 1TB hard drive. The first will house the operating system and all programs and games while the second will take care of the reactive storage of your toy library. This gives you a particularly responsive operation with a reduced response time compared to a solution with a single hard drive, while enjoying a very generous capacity. 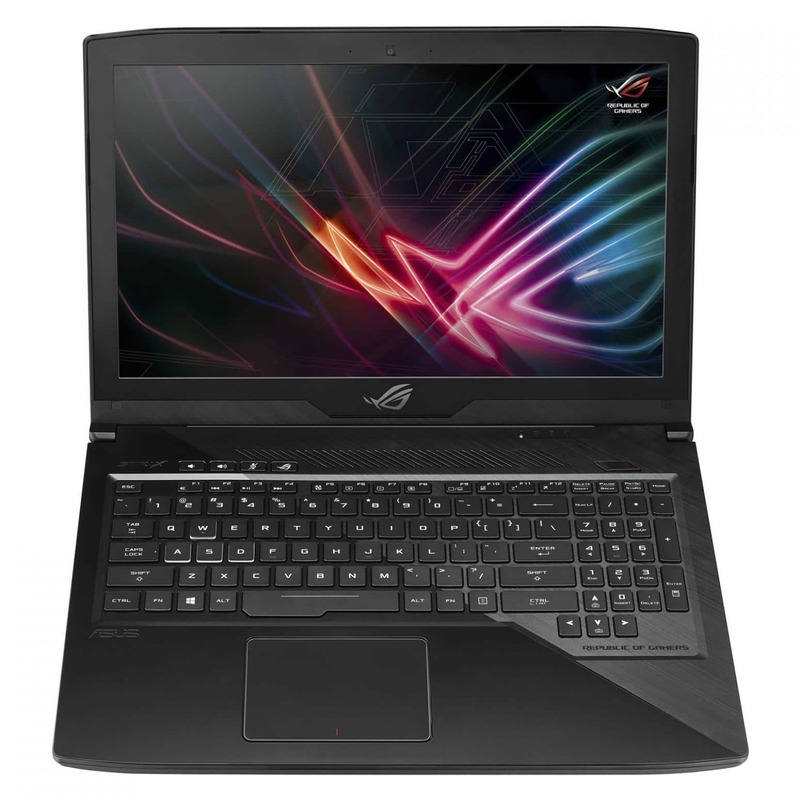 Game machine first and foremost, the PC is based on a top-of-the-line dedicated graphics card of the latest generation, the GTX 1060. In practice, it leaves free field to all players to run their favorite games in Full HD with levels of detail optimum. The game in 4K is also possible (via an external screen) but not necessarily in the best conditions, as well as virtual reality. On the screen side, features turn in favor of versatility. If it does not show refresh rate above the standard or sync G-Sync, it is nonetheless valuable for players. Indeed, it is based on an IPS panel that opens the angles of vision – valuable for players who move as much as their character in front of the screen – and reproduces a more accurate colorimetry TN slab. The Full HD resolution (1920 x 1080 pixels) promises a comfortable viewing density allowing you to get the most out of your High Definition content and the matte treatment reduces glare in a bright environment to better capture the action of the game. Finally, the PC receives a diversified connectivity although the Thunderbolt 3 (via USB Type-C) is not planned. The left side houses an Ethernet port, a mini DisplayPort, an HDMI 2.0 output, two USB 3.0 ports and a jack while the right accommodates the SD card reader, a USB 2.0 port and a Type-C USB port (Gen1 ). The latest generation of WiFi AC and Bluetooth 4.1 modules are also on the menu.